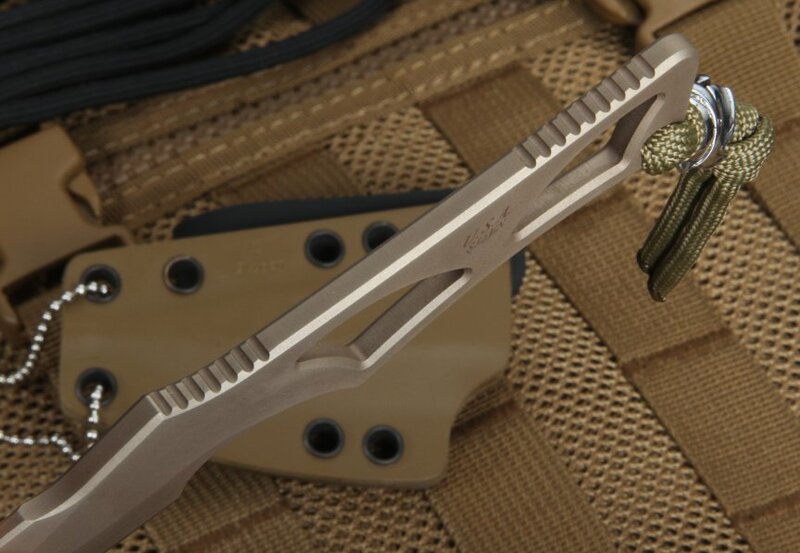 Not all tactical knives are created equal. When you need the versatility of a small, fixed bladed neck knife with the dependability of design Spartan Blades is known for, the Enyo Flat Dark Earth is the one for the job. With a total length of 6.25" and a blade length of just under three inches (and .1875" thick), this knife is all business, whether it is basic cutting needs or tactical defense. At 2.7 oz, the knife is light but tough (CPM S35VN steel with a hardness of 59-60 HRC), that takes and holds an edge as well. The blade geometry is just about as perfect as it gets, well-balanced with a variety of options to hold it and get the most out of its cutting power. Either point-on piercing or cutting can be utilized with a grip that is made for the shape of your hand. 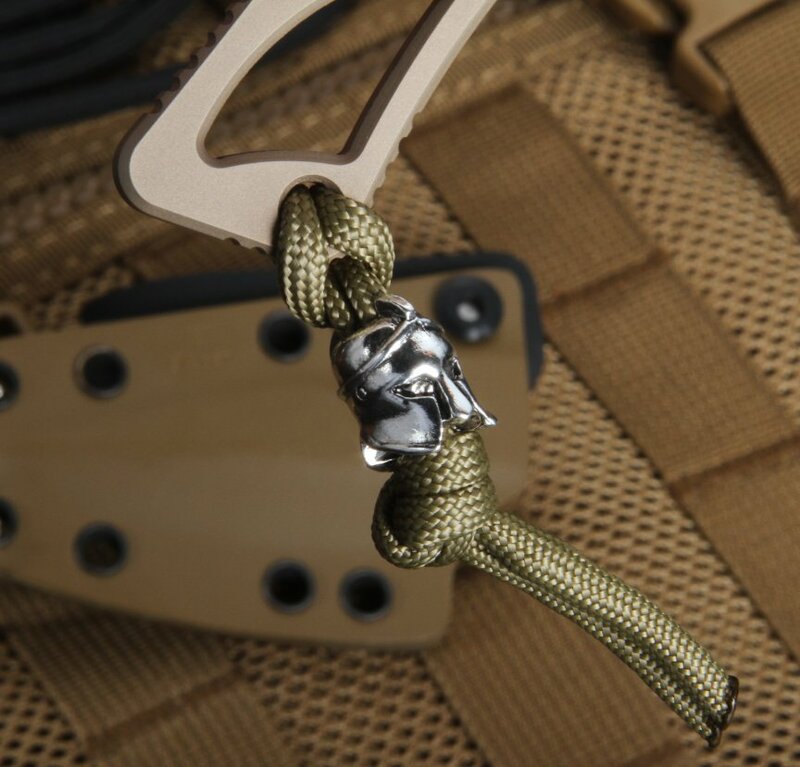 The Enyo can be carried in the Kydex sheath, around your neck on the breakable chain, or on the length of paracord it comes with by the lanyard; really just about any other conceivable way its user can cook up. 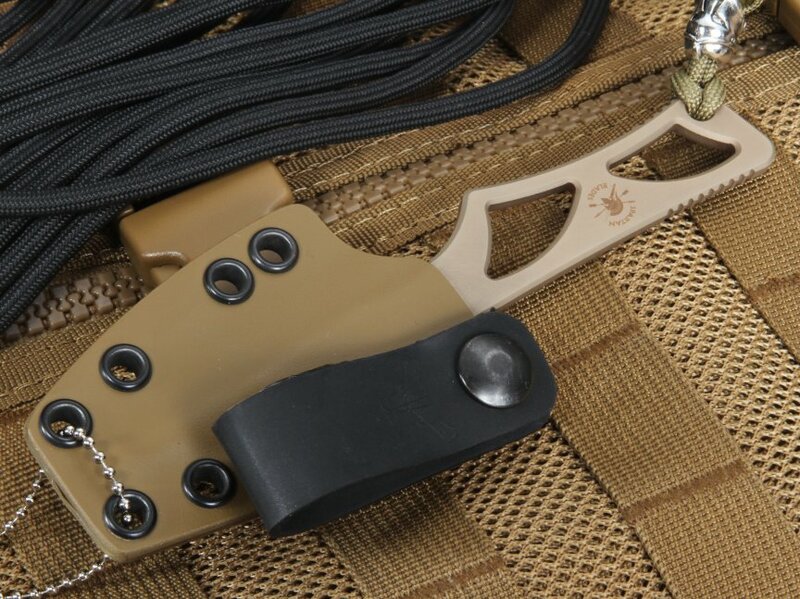 The SpartaCoat-PVD keeps the knife in your hand in spite of sweat or moisture and keeps the shine down to a dull roar like any tactical knife should. 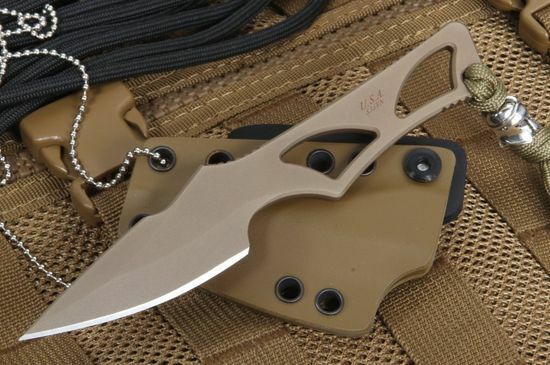 Just about anyone that has discovered this knife has nothing but good things to say about it. 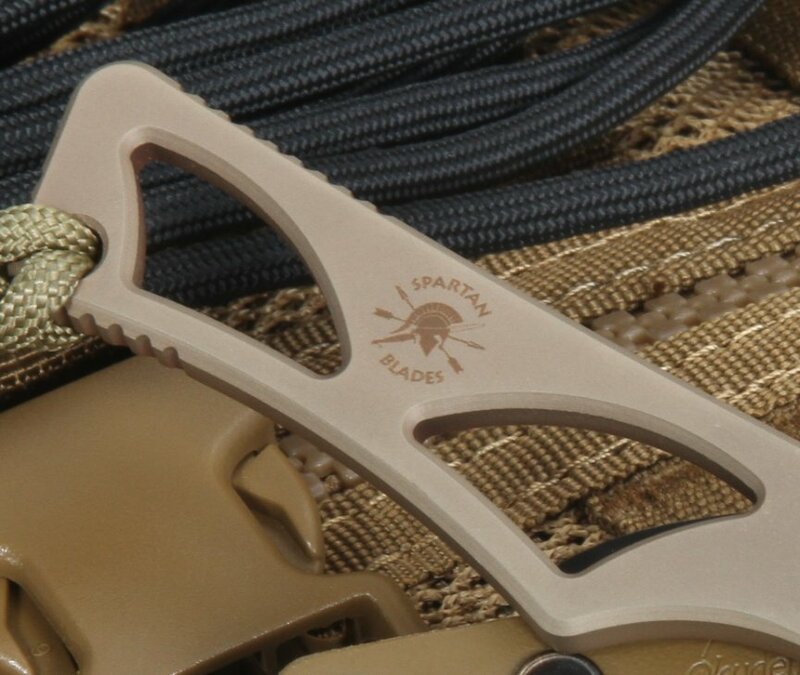 Spartan Blades is known for its quality of knives, and its dedication to dependability and customer satisfaction. It comes with a Lifetime Warranty and is made in the U.S.A.
Knifeart.com stands by this product as an authorized dealer and provides fast shipping, and customer satisfaction you have come to expect from our team of knife enthusiasts. SHEATH: Tan Kydex Sheath with neck chain and IWB (Inside Waist Band) loop. The sheath is Blade-tech hardware ready. I find the Spartan Enyo to be a very well made knife that strikes a perfect balance in terms of size and weight for serving as a neck knife. Love this knife, it started to fall out of the sheath. Sent it back to the place that does the sheaths and they re-did my sheath so that it was good as new. Started playing around with the knife as a throwing knife, it is dead on, hitting point first 70% of the time, which is nice to know in a pinch. I would buy another Spartan blade for sure after this. 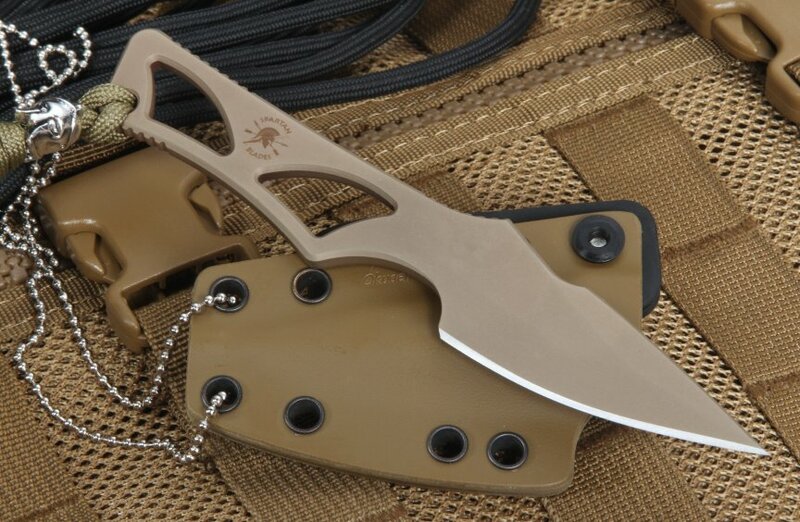 This is my first Spartan knife purchase. Most of their products are too expensive for me, however, when I saw this blade and the cost I wanted it immediately. I can tell you that not only is the knife a solid piece of workmanship, but the kydex- inside the waistband- holster is also outstanding! it is rugged and very sturdy. I replaced my Benchmade push knife with this little beauty! I highly recommend this knife for those that want a smaller fixed blade for emergency and tactical usage. This blade was in perfect condition when received. It was provided on short notice at an acceptable price. It was hard to locate in the color requested and delivery was prompt. You guys came through when needed and for my next edged weapon, I'll check your website first. Thanks. Very nice knife - just what I was expecting.